When the US government publishes a book or other informational materials, it generally means the work is in the public domain. 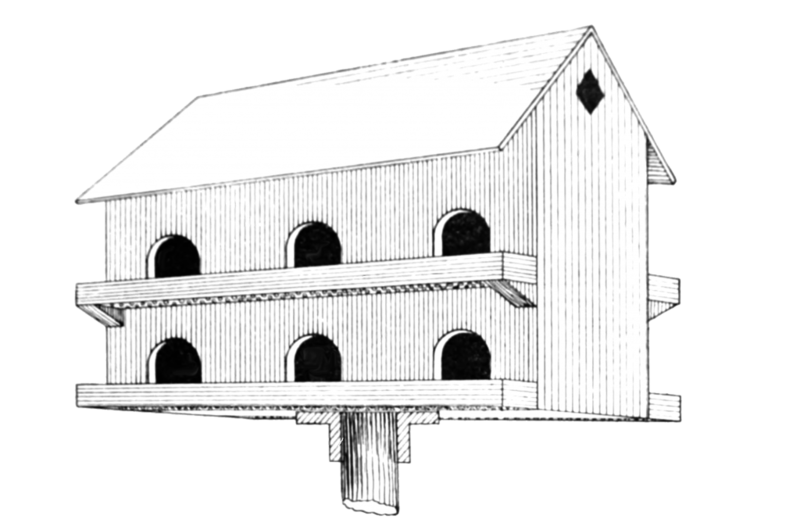 If it’s from 1907, that means the illustrations also have that wonderful vintage look like this barn birdhouse drawing. The book talked about using birds to control cotton boll weevils. Common sense really. If you want to attract birds who like to eat the pest you want rid of, build them nice birdhouses. This birdhouse could house up to 12 pairs of purple martins – 3 on each story, 6 per side. Each story of the barn also has a nice porch and railing for perching. And, it looks like there might also be a penthouse apartment on each side. What bird wouldn’t want to call this barn birdhouse home? I wish the quality of this barn birdhouse drawing was a little better but it’s huge size will hopefully make up for that somewhat. It’s 2002x1325px. And, being a simple line drawing, you could easily turn it into a red barn, a yellow barn or just leave it a black and white barn birdhouse drawing.